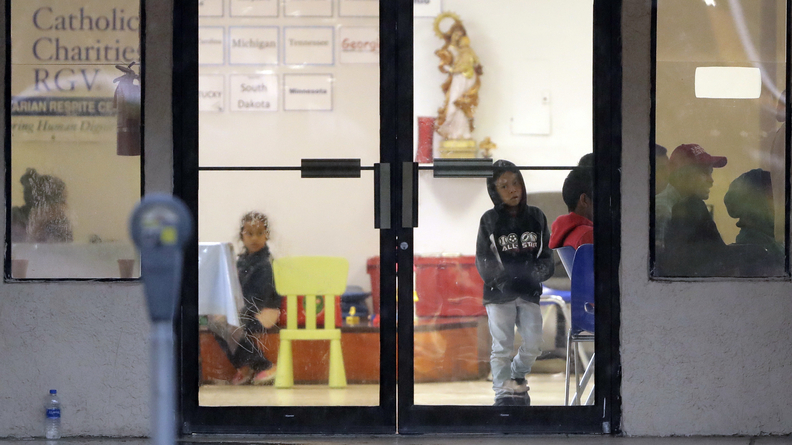 Immigrants recently processes and released by U.S. Customs and Border Protection wait at the the Catholic Charities RGV last month in McAllen, Texas. HHS will send about 100 immigrant children, ages 4 and under, to stay with their immigrant parents in detention next week to meet the first deadline to reunify families separated under the Trump administration's "zero tolerance" policy for people accused of entering the U.S. illegally, according to HHS Secretary Alex Azar. Azar on Thursday criticized last week's court order mandating the tight timeline, telling reporters in a news briefing that the arbitrary deadline fails to account for the complicated processes in place. HHS has faced increasing strain over the last month as part of the sprawling network of state and federal agencies involved in the current immigration issues. To try to speed up the process of unification while adequately vetting parent-child relationships, HHS is using DNA swabs to verify children's parents, Azar said. The department so far has not sent any kids to their parents in detention. Per the California federal court's injunction, HHS' Office of Refugee Resettlement (ORR) has until Tuesday to reunite kids age 4 and under with their parents or guardians. Many of those children are detained in Immigration and Customs Enforcement facilities, Azar said. The department has until July 26 to release the rest, ages 5 to 17. Meanwhile, the Department of Homeland Security, which has jurisdiction over ICE, is also moving parents of children 4 and under to detention centers close to the ORR facilities where their kids are being kept, Azar explained, "in order to speed the process." HHS has contracts with permanent facilities in at least 15 states. Fewer than 3,000 kids fall under the court's injunction, according to the secretary, although he characterized the estimate as a moving target because HHS officials are counting all unaccompanied minors who said that they were separated from their parents at some point on their journey to the U.S., but not necessarily at the point of entry. The grantee facilities who contract with HHS to care for immigrant minors currently have custody of about 11,800 kids under 18. The costs of the system, in the meantime, are more nebulous. Of the $1.86 billion appropriated by Congress in fiscal 2018 for refugee and entrant assistance, $1.3 billion was earmarked for unaccompanied minors. Congress designated $320 million for medical and transitional services, and $155 million for social services. The congressional appropriation limits transfers among HHS accounts to not more than 3%, but the refugee and entrant assistant account lifts this cap to 10%. The Administration for Children and Families—which has jurisdiction over the unaccompanied minor program—allocates about 15% of its funding for medical care, background checks and family reunifications, according to its budget justification for fiscal 2019. As of deadline, HHS had not clarified whether this includes expenses such as the DNA testing. According to the Administration for Children and Families document, 80% of its funding goes to "bed capacity care," and 5% goes to administrative costs. The budget justification goes on to note that since HHS assumed responsibility for migrant minors through fiscal 2011, fewer than 8,000 children fell to its care each year. The document chronicles only one spike, in fiscal 2016, when the agency got referrals for 59,000 children that left the Obama administration's HHS struggling to care for them all with temporary shelters. There was a similar spike in 2014, but the document doesn't mention it. From fiscal 2014 through fiscal 2016, the federal funding for the unaccompanied minor program stayed relatively flat, between $912 million to $948 million. In the first quarter of 2017, when President Donald Trump assumed office, 23,000 unaccompanied minors came into HHS custody, "the highest first-quarter referrals in the history of the program," according to the budget justification. But the numbers flattened and overall just under 41,000 kids in total entered HHS custody although Congress had boosted funding for fiscal 2017 to $1.4 billion. Still, as numbers of kids in the program waned, temporary shelters were shuttered and the permanent bed capacity reduced until the number of incoming kids started to pick up again in the last six months of 2017. Even in years when the congressional funding for the unaccompanied minor program stayed flat, contracts for facilities with custody of the kids increased sharply. Southwest Key, a not-for-profit with facilities in Texas, California and Arizona, saw their revenue rise from $95 million in fiscal 2013 to $242.8 million, with almost 99% of that coming from grants and contracts. As previously reported by Modern Healthcare, by fiscal 2016 the organization was netting $16.6 million in profit, nearly double the profit from the previous year, and CEO Juan Sanchez's salary had spiked from $269,000 in 2010 to $1.5 million in 2016, according to tax records. The company's contracts for fiscal 2018 will climb to nearly $450 million. Since 2015, an Indiana-based carrier called Point Comfort Underwriters has processed payment claims for community care for these kids, paying Medicare fee-for-service rates. The company took over from the Veterans Affairs Department, which still processes payment for independent providers of care for migrant adults in DHS and ICE detention. Point Comfort could not disclose how many claims they process each year for the unaccompanied minor program or their annual spending. The company also could not specify the funding stream. As of deadline, HHS did not clarify those numbers. The complications could mount once HHS transfers the kids to their parents' detention centers and as the furor and litigation rage in the fallout of the Trump administration policy. In addition to the lawsuit that led to the recent court order—originally filed in February by the American Civil Liberties Union on behalf of a Congolese immigrant family—17 Democratic attorneys general have lodged a separate lawsuit that names Azar, HHS, ORR and other departments and administration officials as defendants. Legal allegations, in addition to citing trauma inflicted by separation of children from parents, include a story from an El Salvadoran women who lost her son in the early days of the separation policy for 85 days. "When I took off his clothes he was full of dirt and lice. It seemed like they had not bathed him the 85 days he was away from us," the mother, Olivia Caceres, said in the court filings. Azar declined to comment on pending litigation. "I will say it's important to remember: not every picture you see is a picture of a child in an ORR facility," Azar said. "Not every reunification is of a child from an ORR facility."